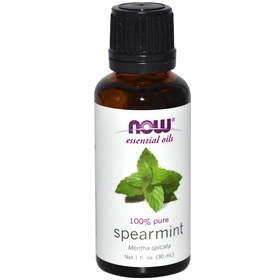 NOW Spearmint Oil - 1 oz. Refreshing and invigorating, the aroma of spearmint has been enjoyed throughout the ages for skin and digestive disorders. NOW Spearmint Oil is 100% pure and natural, and steam distilled from the leaves of Mentha spicata. Spearmint has a minty, slightly fruity scent, softer than peppermint. A rich antioxidant, spearmint helps support the respiratory and nervous systems and may help open and release emotional blocks leading to a sense of balance and well-being.